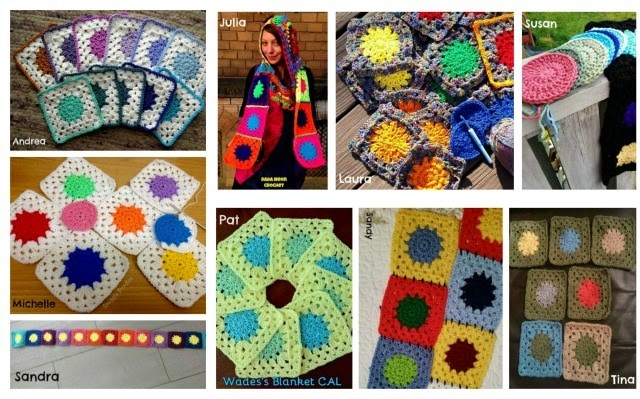 Hello and welcome to Part 2 of the Wade's Blanket CAL, hosted by Zooty Owl and Kokopelli Design. Sadly little Wade lost the battle with cancer. Rest in peach with the Angels lovely golden haired boy! I will be compiling a Gallery of YOUR progress for every post - so please feel free to share your photos with Andrea and/or me on Facebook! Row 4: Working on the right side 3ch (counts as 1dc ), 2dc into same space; 3dc into each space between 3dc groups to corner; [(3dc, 2ch, 3dc) into corner 2ch; 3dc into each space between 3dc groups to corner] x3; ( 3dc, 2ch, 3dc) into corner 2ch, sl st into 3rd of start 3ch to close row. Break off yarn. Turn work. Row 6: Working on the right side 3ch (counts as 1dc ), 2dc into same space; 3dc into each space between 3dc groups to corner; [(3dc, 2ch, 3dc) into corner 2ch; 3dc into each space between 3dc groups to corner] x3; ( 3dc, 2ch, 3dc) into corner 2ch, sl st into 3rd of start 3ch to close row. Break off yarn. Granny squares are so much fun to make and are so versatile too. Turning your work after every round ensures that your work does not "lean" towards one side. This way you can just keep going and going and your granny square will remain perfectly square no matter how big you make it! Have fun making your squares! See you again in two weeks with Part 3 of Wade's Blanket. I really love this blanket, but need to finish a couple of other things before I start. But can I ask a question? Can you tell us how many of each square to do, please? There are three sets of squares measuring 12cm x 12cm and one set measuring 6cm x 6cm. I made 8 each of the 12cm x 12cm and then 12 of the 6cm x 6cm. The stripes are not affected by the number of squares so you may make the blanket as big or as small as you like. Thank you, Zelna. I did try to reply a while ago, but it wouldn't let me post for some reason. How many of these do we make?? Hi. I'm sorry to hear bout the little one. May he rest in peace. Thank you for part two. Crochetqueen.bh@gmail.com. I'm doing the first part. I'm doing other works at the same time, but I keep going. Now I know we must shout the work. I'll send tou a photo. I am so sorry to hear about little Wade. I am sure he will enjoy watching the blankets from heaven! Thank you for Part 2. I'm so sorry to read that Wade has passed away.